More than just emotional and religious commitments, weddings are legal commitments. 1 Who Can Legally Perform a Wedding Ceremony in Tennessee? 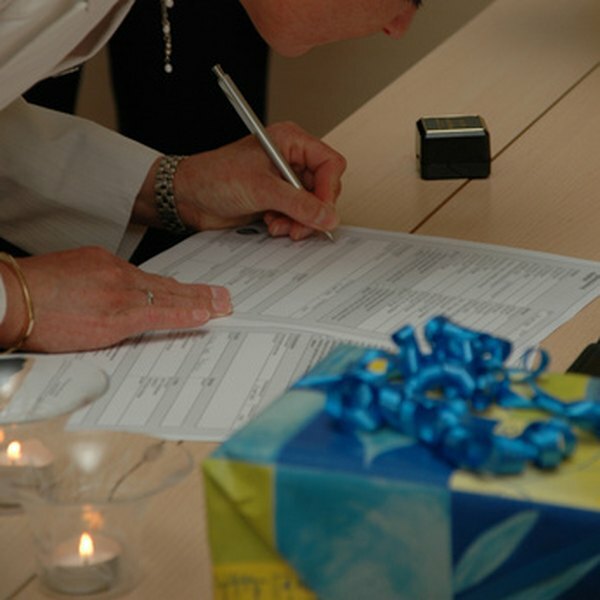 One of the most important aspects of wedding planning is choosing an officiant. You can pick out beautiful locations, breathtaking dresses, delectable dishes and fabulous flowers, but unless you have someone there to actually perform the ceremony and marry you and your mate, it will all be for naught. Knowing who actually can perform a wedding in the state that you are being wed is an important first step. In New Jersey, there are a number of different people who can officiate at a wedding. In the state of New Jersey, any ordained minister or clergy member of any religion may perform a wedding. This means that priests, rabbis, reverends, pastors and other spiritual leaders are entitled to officiate at a wedding, as long as they are duly ordained. This privilege also extends to ministers that were ordained via the Internet, although you should make sure you verify their credentials. Visit the website through which they received their ordination in order to make sure that they are indeed allowed to perform marriages. Judges in the state of New Jersey can also perform marriages. This right extends to both current and retired judges, provided that they left their office in good standing. Judges can be from the federal circuit court, the superior court, the juvenile court, the municipal court, the county court or even the tax court. U.S. Magistrates are also allowed to officiate at weddings in New Jersey. These individuals may perform the ceremony at the courthouse or can be engaged to perform the marriage at an alternative location. In addition to clergymen and judges, the mayor or town supervisor of any township in New Jersey can officiate at a wedding. The deputy mayor may perform a wedding only if specially appointed to do so by the sitting mayor. In addition, county clerks also have the right to preside over a wedding. Although some states may have a justice of the peace who can perform weddings, New Jersey has no such office, nor does it allow notaries to perform wedding ceremonies. NJ Wedding: Who Can We Get To Marry Us?